Aptitude test is a test that is used to analyze a person’s understanding of a particular topic or a field. These kinds of tests are designed to check thinking and logical reasoning of a person. There are multiple choice questions in the aptitude test and every student has to follow certain rules on how to attempt the aptitude test. 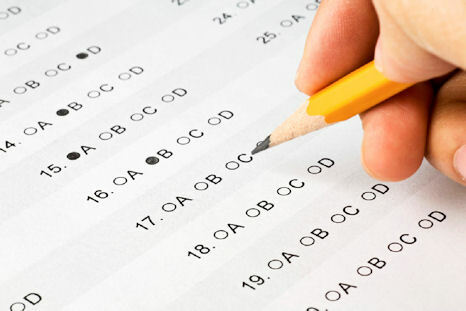 Number of Multiple choice questions depends on the subject for which the aptitude test is being conducted. These tests can be done online or on paper. The benefit of online test is that, sometimes you could get the test results just after the test. You could also take the online test at home, if the employment agency allows it and also to mention, this is very cost effective. These types of tests can also be called power and speed test as there is a time limit in which a student is required to complete the exam. The speed level tests conducted can be for the posts that are not professionally inclined but the power test are the ones that are professional and although the number of questions is less, questions are more complex than ever. Different type of tests requires different type of aptitude format. Questions can be purely technical or logical or both. It totally depends on the type of examination. Aptitude tests are conducted for tests like GMAT, GRE, SAT, etc. GMAT or Graduate Management Admission Test is a computer based standardized aptitude test that is conducted to analyze certain skill set of students. Those students who are interested in doing MBA should take this test. This test does not analyze intelligence of students but it helps to assess skills of students that will help them to achieve great heights in management and business world. SAT test is conducted for the college admission purpose in USA. It was first introduced in the year 1926 and was then known as Scholastic Assessment test. After that it’s name changed to Scholastic Assessment test and then and now it is only called SAT. This aptitude test is used to check the student’s readiness for the college world. Graduate record examination or GRE is a test which is a necessary test that is required by most USA schools. ETS created this test in the year 1949. It is usually a computer based Aptitude test that is taken by the students in the testing centres. This test is usually conducted to check a student’s ability to take admission in a particular course in any department of the Graduate school. In order to avail free counseling concerning the above courses, call on 9878222772!